As part of demonstrations taking place at schools around LA Unified and in cities across the country, a group of roughly 100 protesters made up of parents, students, district leaders and politicians gathered outside Hamilton High School Wednesday morning to rally in support of public education. Pedrosa’s fellow students talked about being at Hamilton with special needs, or in special programs like music, arts or Arabic language, with teachers and counselors who help them even after hours. They also talked about having class sizes of more than 40 students and not having enough resources. One student talked about coming over from Mexico at 6 years old with her sister. Alex Caputo-Pearl, president of the LA teachers union, UTLA, said that 40 cities throughout the country and 170 schools at LAUSD alone were participating in the Alliance to Reclaim Our Schools demonstrations. LA Unified Superintendent Michelle King, who worked for a decade at Hamilton, stood in the background of all the activity. Although she was mentioned during the speeches, she did not speak herself. “I’m here to celebrate Hamilton and the great work going on here. I’m here to see the kids and the faculty,” King told LA School Report. 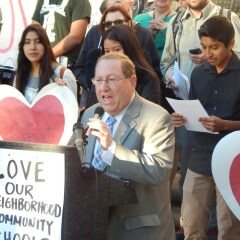 Los Angeles City Councilman Paul Koretz spoke at the rally and said a long-retired teacher at the school, Wayne Johnson, was responsible for sparking his interest in politics. 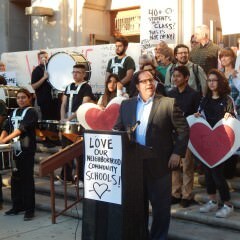 LA Unified school board President Steve Zimmer led the procession into the school with a marching band and the charge: “We walk in!” School board member George McKenna and Juan Flecha, president of the Associated Administrators of Los Angeles, were also among those walking in at Hamilton. “We walk in for the future of public education and we know that any plan, any strategy to change public education must be about all students, not some students,” Zimmer said. With that, the marching band, teachers, parents and students walked into the foyer of the school and gathered around a marble life-sized statue of Alexander Hamilton, for whom the school is named.